Skip Hop, one of our go-to favorite companies for eco-minded, safe kid gear has released some festive new zoo critters for the holiday season. Keep reading to learn more about these adorable limited edition zoo gift sets. The new wintry zoo packs are ready to embark on any outdoor winter adventure with your little one. Each zoo backpack has a roomy main compartment, perfect for any preschool supplies your child may need for his busy day, plus a front pouch that works well for storing mittens and other cold weather gear. There’s also extra pockets for snacks and a mesh side strap that easily adjusts to fit a juice box, sippy cup or thermos. Bonus, each zoo pack includes an adorable tiny clip-on collectible character that attaches anywhere. Available in Polar Bear, Penguin and Moose. Frigid temps are no match for the insulated limited edition Zoo Lunchie Gift Set! Featuring a wipe-clean interior and a roomy main compartment ideal for packing a warm lunch on a cold day. Each lunch bag comes with a cute matching Zoo straw bottle and an interior mesh pocket holds canteen money or utensils. Available in Polar Bear, Penguin and Moose. The new arctic Zoo friends are the perfect mealtime companions for your child. Each tableware gift set includes a dishwasher safe plate, bowl and tumbler perfect for hot cocoa and warm meals. The plate features divided sections to separate food – great for picky eaters. The matching fork and spoon feature stainless steel heads and soft side grips to make it easy for kiddos to hold. All items are dishwasher-safe. Available in Polar Bear, Penguin and Moose. These special limited edition zoo items feature animals who like a frosty living environment, festive seasonal colors and sweet holiday touches such as snowflake gift tags, but your child will enjoy using these sets year-round too. Skip Hop pays attention to safety. All of the winter gift sets are BPA-free and phthalate-free. 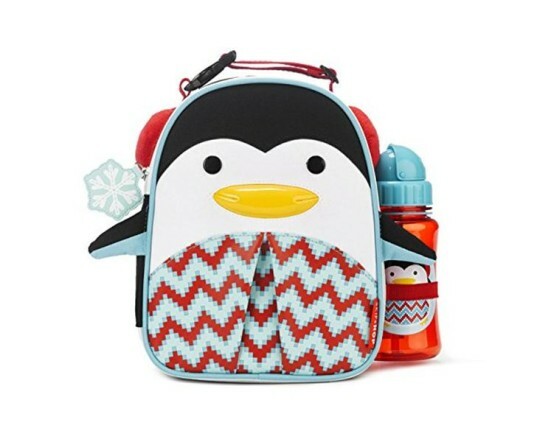 The backpack comes with padded, adjustable straps to keep your child comfortable while insulation in the zoo lunchie keeps your child’s food cold or warm as needed. 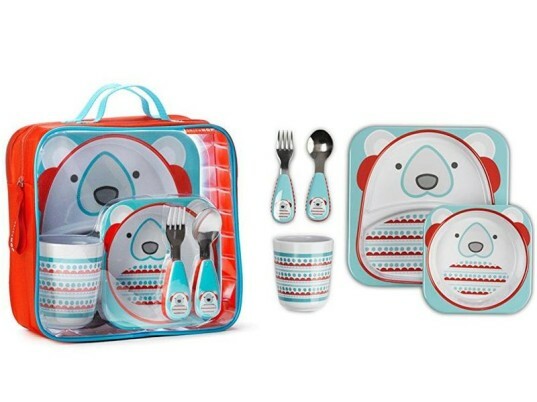 Both the zoo pack and lunchie bag are safe for kids ages three years and up while the tableware sets are safe for kids ages six years and older. All of the adorable limited edition Skip Hop Zoo Gift Sets can be ordered right from the Skip Hop website. Plus, these sweet winter gift sets are priced so reasonably, each kiddo in your family can have one! 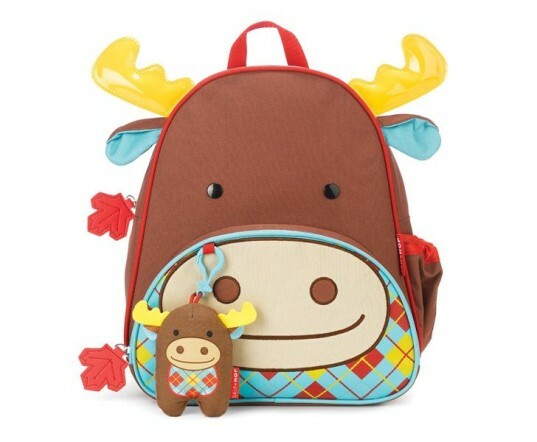 The new wintry zoo packs are ready to embark on any outdoor winter adventure with your little one. 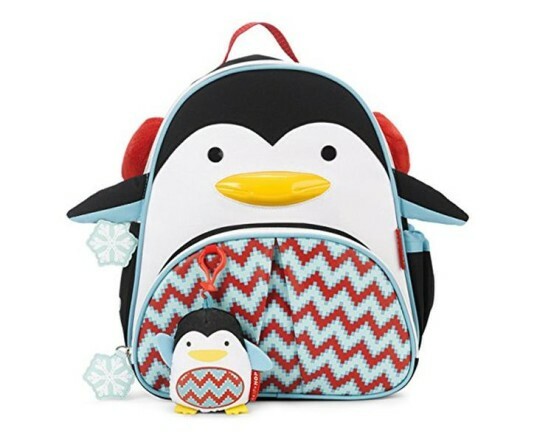 Each zoo backpack has a roomy main compartment, perfect for any preschool supplies your child may need for his busy day, plus a front pouch that works well for storing mittens and other cold weather gear. There's also extra pockets for snacks and a mesh side strap that easily adjusts to fit a juice box, sippy cup or thermos. Bonus, each zoo pack includes an adorable tiny clip-on collectible character that attaches anywhere. Available in Polar Bear, Penguin and Moose. The new arctic Zoo friends are the perfect mealtime companions for your child. Each tableware gift set includes a dishwasher safe plate, bowl and tumbler perfect for hot cocoa and warm meals. 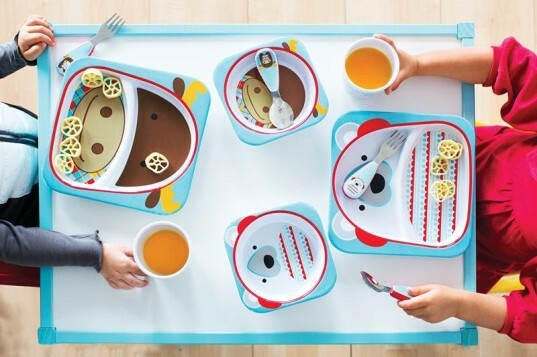 The plate features divided sections to separate food - great for picky eaters. The matching fork and spoon feature stainless steel heads and soft side grips to make it easy for kiddos to hold. All items are dishwasher-safe. Available in Polar Bear, Penguin and Moose. Skip Hop pays attention to safety. All of the winter gift sets are BPA-free and phthalate-free. 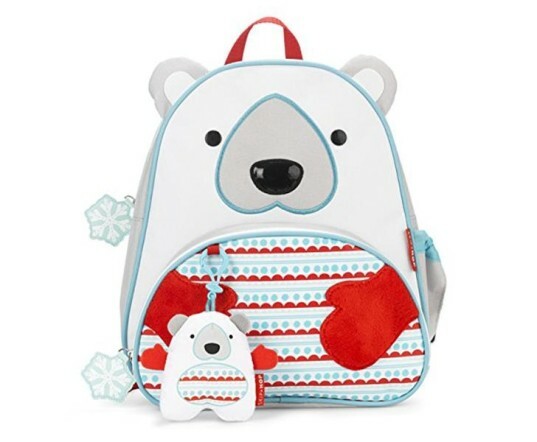 The backpack comes with padded, adjustable straps to keep your child comfortable while insulation in the zoo lunchie keeps your child's food cold or warm as needed. Both the zoo pack and lunchie bag are safe for kids ages three years and up while the tableware sets are safe for kids ages six years and older.